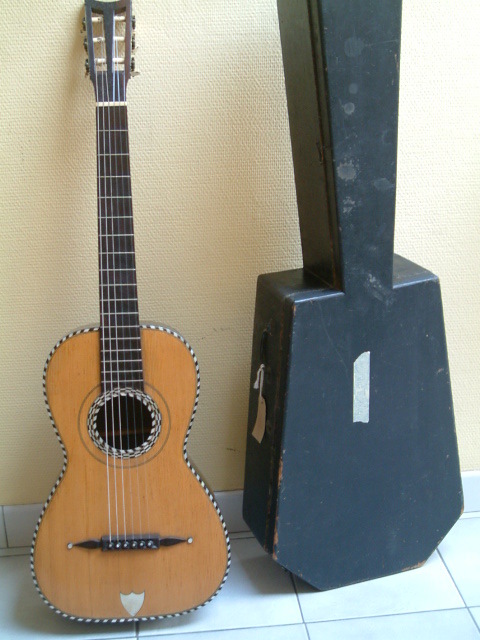 The photo left is a period Fabricatore, and the others are reproductions of originals by luthier Bernhard Kresse. Here is a chart showing what instruments were played by the most famous guitar composers of the early 19th century. This information is based on some surviving written accounts, luthier information, surviving ownership and instruments. It is always possible new information could be revealed to change our thinking. Laprévotte Since Aguado came from Spain, he must have used Spanish instruments early in his career, but information as to which specific builders has not surfaced. After his arrival in Paris, various accounts indicate he used French guitars by Lacôte and Laprévotte. The oval-shaped soundhole of the guitar Aguado is playing in his famous lithograph is clearly a Laprévotte design, while another drawing looks like an early Guadagnini guitar. Jimmy Westbrook’s book shows actual photos of Aguado’s later guitars: these are nearly as large as modern concert guitars and are surprising to see in a French design. Arcas Torres Arcas initially played Spanish guitars, probably in the style of Martinez and Panormo early in his career. Later Arcas worked with Torres in the 1850′s and 1860′s to slightly customize the Torres guitar to his specifications (Tarrega was born in 1852, thus the Torres was already established). 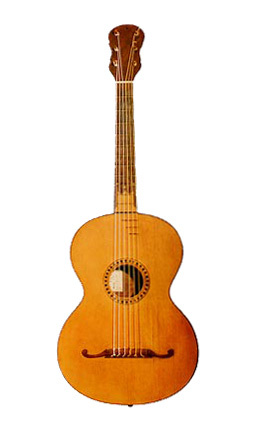 This basic design, similar to other Spanish guitars of the period, has become the standard modern classical guitar, although the original Torres was smaller and had a somewhat different sound than today’s modern classical guitar. Carcassi Lacôte ? I have not been able to find documentation as to the maker of guitar used by Carcassi, although 19th century depictions of Carcassi indicate he played a French style guitar, probably by Lacôte or his rivals. I asked musicologist Matanya Ophee, and he is also not aware of any sources which reveal Carcassi’s guitar, other than the following: “The only reference to this I know, was an article in Cadenza magazine in the late 1890s, where an American claims to have bought a guitar from Carcassi and bring it to the US. There is a fairly good description of the instrument, but no name attached to it.” Prior to arriving in Paris, Carcassi undoubtedly played Italian guitars similar to Fabricatore. Carulli Lacôte It is well established that Lacôte built guitars for Carulli. Gary Southwell confirms this detail. Prior to arriving in Paris, Carcassi undoubtedly played Italian guitars similar to Fabricatore. Coste Lacôte Coste’s Lacôte guitar is in a museum; it was a 7-string instrument of Coste’s own specifications. Degen Stauffer A photo of Degen indicates he is playing a 7-string guitar by Stauffer. Interestingly, as Coste’s duet partner and friend, Coste surely came into contact with Stauffer guitars as well. Stauffer ? Contemporary accounts indicate Giuliani probably played a Fabricatore at one time. A recent discovery (cover of GFA Soundboard Magazine) shows that Giuliani owned a French guitar by Pons, a gift of Napoleon’s wife, which he later gave away (presumably to settle debts) and likely did not play in concert. You can read the article on this topic here: www.paulpleijsier.nl/assets/pdf/soundboard_2001.pdf (Written by Paul Pleijsier). Giuliani was in Vienna and is depicted in paintings playing a guitar that resembles a Stauffer, and surely Giuliani would have come into contact with Vienna’s leading builder during his years there, but no proof of this association exists. Giuliani’s close friend, the famous composer Franz Schubert played a Stauffer. In the Fabricatore section below, one source claims to have Giuliani’s Fabricatore guitar, with photos. My best guess is that Giuliani switched from Fabricatore to Stauffer while in Vienna. Huerta Panormo Depictions of Huerta from his own time clearly show Huerta playing a Panormo guitar. Published music was issued and underwritten by Louis Panormo, and Huerta was married to Mr. Panormo’s daughter. 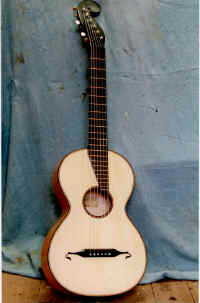 Luthier Gary Southwell also confirms Huerta’s concert guitar was made by Panormo. Legnani Legnani worked with Stauffer to derive the famous “Stauffer-Legnani model” which was regarded as the finest model in that part of Europe. Legnani also played an 8-string Stauffer and wrote compositions (notably op 201,202,203) for it. Gary Southwell confirms this detail. Prior to arriving in Paris, Legnani undoubtedly played Italian guitars similar to Fabricatore. Other Viennese guitars, e.g. by Reis, mention Legnani on the label, but it is not clear whether this was a collaboration, or simply copying the Stauffer style. Legnani also collaborated with Ries and possibly others which also have the Legnani label. It is believed that Legnani also built his own guitars later, but only one instrument claimed to be his to my knowledge has survived: a large body Guadagnini style instrument. Scherzer We know from Makaroff’s accounts that he played an 8-string Stauffer, and 8-10 string Scherzer guitars (Scherzer was Stauffer’s foreman). Gary Southwell confirms this detail. Makaroff tried many luthiers and was of the strong opinion that Stauffer and Scherzer were the best luthiers in Europe, though he was perhaps not exposed to the guitars of the Paris school. Scherzer We know from Makaroff’s accounts that Mertz played 10-string Scherzer guitars (Scherzer was Stauffer’s foreman). Gary Southwell confirms this detail and that Mertz also played Stauffer, presumably 6-string. Mertz was from Vienna and this is to be expected. Grobert (Paris) The book by John Sugden: Paganini in the series of “The Illustrated Lives of the Great Composers” lists the estate sale contents of Paganini’s musical collection. “Mr. George Withers has purchased from the widow of Signor Luigi Guglielno Germi.. the following highly interesting collection, which was left by the world-renowned violinist, Nicolo Paganini, to the late Signor Germi, ..” This included “An Italian Guitar, by Gennaro Fabricotar (sic), Anno 1819, Napoli, ebony ornamentation over table. (This instrument was for many years used by Nicolo Paganini).” This guitar sold for only 25 English pounds (! ), presumably in the late 19th century, and it is not known who owns it today. Françoise Sinier de Ridder notes that there is a drawing showing Paganini playing his Fabricatore in “Casa de Paganini” in Genova. The famous Paganini-Berlioz museum guitar shows that Paganini played this Lacôte-style instrument made by Grobert of Mirecourt, France, at one time. This instrument was used for a short period, and we do not know what other instruments Paganini played, other than presumably Italian guitars. The Martin guitar web site claims that Paganini played Stauffer guitars, but I do not know the validity of this information. Padovetz Friedrich Schenck, Vienna 1841 (Staufer workshop) Photos and historical documents reveal that Padovetz played a 10-string guitar patterned after Staufer innovations, and very much like the Scherzer instrument played by Mertz, with the additional ability of using a device to raise the bass notes one pitch. Pettoletti Stauffer ? Evidence is unclear, but it is believed that Pettoletti played Stauffer guitars before switching to Russian 7-string instruments made in St. Petersburg. Other 19th c. London guitars Gary Southwell has examined and copied Madame Sydney Pratten’s concert guitar ca. 1850. Madame Pratten is also shown in a photo playing a J. Guiot circa 1844 guitar. She also worked with builders on specifications and endorsed several fine instruments: in the Lacote style, but larger. Schubert Stauffer A surviving instrument proves that Schubert played a Stauffer instrument. Gary Southwell confirms this detail. Schubert was from Vienna and this is to be expected. In addition to Schubert’s guitar, Stauffer made an arpeggione for him. Sczepanowski Panormo Gary Southwell confirms Sczepanowski’s concert guitar was made by Panormo. LacôteAlso: Martinez, Schroeder, Alonzo, Benediz Sor mentions many builders in his Method, and presumably he played all these instruments at one time. Sor favored fan-braced Spanish guitars such as Pages, Martinez, Rada, and Benediz and had Panormo build a Spanish-style instrument to his specifications. Sor also praised Lacôte in his method, and it is commonly said that this was his main concert guitar, also Adam Holzman told me this in a master class, though I do not know the reliability of this information. It is known that Sor left Coste with his Spanish guitar by Rada when he died. Zani de Ferranti Lacôte Ferranti’s biography by Simon Wynberg details the instruments left behind by Ferranti. Also Gary Southwell confirms Ferranti’s choice of instrument. Quick responsive sound, balance and clear mellowness; early guitars with a delicate sound. Slightly punchy sound, warm and clear. Focused and very loud, punchy. Mellower and warmer. Pons, Lacote, Lamy, etc. Fabricatore, Guadagnini, etc. Staufer, Brunner, Schertzer. Lorca, Pages, Martinez, Panormo. The Italians began commonly building 6-string guitars in Napoli in the 1790′s as evidenced by Fabricatore and others. Surviving instruments can be found earlier, but authentity of very early guitars (e.g. early 1790′s and before) is sometimes in dispute. It is important to note that many instruments which were originally 5 double-course “Baroque” guitars from the late 18th century were later altered in the early 19th century for 6 single-strings, by changing the headstock, bridge, and nut. A pair of Fabricatore guitars survives; they are identical except one is a 5 (double) course baroque guitar and the other is a 6 (single) course classical guitar. 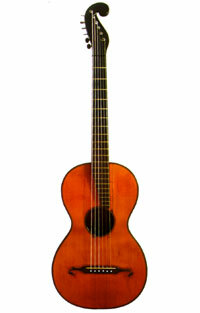 Additionally, a 5 single-string Fabricatore exists – apparently original, and apparently during the transitional period. Moretti, an Italian who switched from the baroque guitar, wrote a method for the new 6-string instrument, and composed music which influenced Sor. Most early Itaalian guitars were highly ornate. 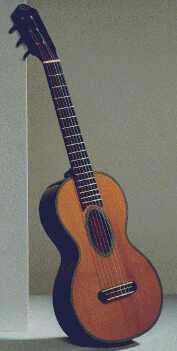 The Italian school seeded the Viennese school, and later the Viennese guitar innovations were adopted in Italy so that the two styles became nearly the same. Near-identical body styles The composers who used Italian guitars were of course the Italian guitarists such as Giuliani, Legnani, Carulli, and Moretti. These guitarists later switched to other instruments. There were dozens (or perhaps hundreds) of Italian builders in this time period, but Fabricatore is the most famous. Guadagnini also deserves special mention; surviving instruments are still played by Duo Maccari-Pugliese, Leopoldo Saracino, and John Williams on his re-recorded Giuliani opus 30 Concerto in A. 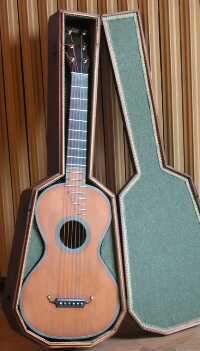 The Guadagnini family, which included guitars by Carlo and Gaetano, came in a large and small model. Guadagnini was mostly known as a maker of violins, but today the guitars are also collector’s items. 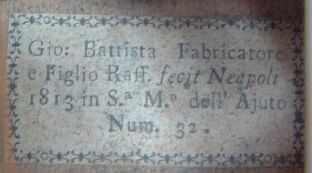 The 1790 instrument depicted above reads: “Gennaro Fabricatore Fecit in Neapoli Anno 1790 Strada S. Giacomo N. 37″. The 1813 instrument is a rare guitar by Gianbattista made with his son (figlio in Italian) Raffaele Fabricatore’s assistance. It appeared on EBAY in 2002 and was purchased by a Japanese collector after active bidding. According to the CRANE Homepage by Makoto Tsuruta, the smaller labels of the type above, indicated custom instruments made by the Fabricatore’s themselves, whereas instruments with the larger label containing a woman playing the guitar were less expensive instruments made by other luthiers and labeled for resale by Fabricatore. However, all of these guitars were considered high quality labels according to many sources, but the custom Fabricatore’s are the most valuable to collectors. An excellent source of information on Fabricatore is the Research on Fabricatore Family from the CRANE Homepage by Makoto Tsuruta. This has the most comprehensive information on-line to date of the family tree, individual makers, construction characteristics, etc.. Makoto’s page also shows a pictoral overview of building a Fabricatore style replica: Lutherie: Makoto Tsuruta Making a Fabricatore style guitar. Guitar made by Luigi Legnani The Italian and German schools influenced each other, and became indistinguishable very quickly, particularly in the case of Stauffer and Fabricatore. 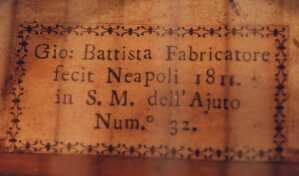 Early guitars by Stauffer, a cello maker, were copies of Fabricatore. Later Stauffer developed his own model and later still Fabricatore in Naples made guitars in Stauffer’s style. Stauffer designs and innovations became the standard model throughout Austria, Germany, Eastern Europe and Russia. Do not assume that if you find an antique guitar in the style of Stauffer (or Staufer) and Martin guitars, that it was actually made by one of these 2 builders. Stauffer and Martin are among the most widely counterfeited instruments around, with countless fake labels in existence. Thousands of 19th-century guitars in the German-Viennese style of Stauffer and Martin were made in those days. It was the prevailing guitar design of the day, just like today everybody makes classical guitars that look like Torres. You cannot be sure that a guitar of this style is a Stauffer or a Martin unless you have convincing proof and documentation of authenticity. Guitars in this style were made for 75 years throughout Germany, Austria, Russia, and Eastern Europe by dozens, if not hundreds of makers. Only an expert can tell a true Stauffer or Martin from the rest. Staufer is the most famous builder of the Viennese school of guitar, whose work summarizes that school of building. (Some guitar labels say Staufer, others Stauffer – though it is commonly spelled Stauffer by many.) There are many guitars of the 19th century made by other makers which copied Staufer’s design. 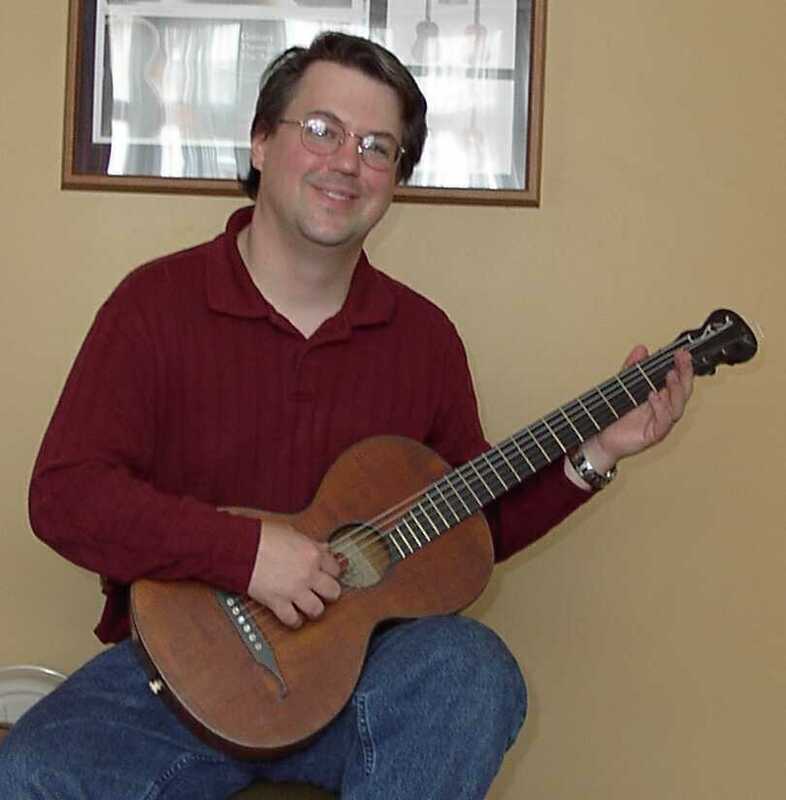 Staufer is famous today because of the many innovations in guitar design he introduced. The most well-known Staufer guitar type is the Legnani model based on collaboration with the famous guitarist Luigi Legnani. 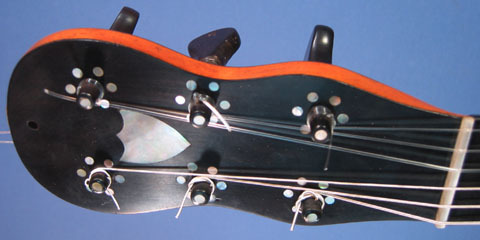 Staufer headstocks often had the “Persian slipper” shape with single-side machine tuners, a shape still used in Fender Stratocaster electric guitars today. The Rodgers Stauffer Machine Heads article describes the tuner design. The body shape has very pronounced upper and lower bouts, much closer to the modern design. It is not known exactly when the “Legnani model” of Stauffer appeared. Kresse estimates around 1815. Alain Bieber estimates it was around 1821 (+/- 1 year), and improbable in 1815, as “that would be more than six years before the Ertl-Stauffer Privilegium”. It is also a subject of discussion as to what made the “Legnani model” different from other Staufer or Viennese guitars. Kresse believes “the most important specification for the “Legnani-model” was the stronger waisted body and strongly bowed neck. All other attributes like the adjustable neck, machine (tuners), 23 frets, and short scale do not seem to be absolutely necessary and you will find the Legnani-label also on guitars that do not have these specifications.” Philip Bone’s “Guitar and Mandolin” states: “Stauffer .. was a guitar maker living in Vienna, and he had received the patronage of the guitar virtuosi of the time – the renowned Regondi having used one of his guitars for a period: Legnani, too, supplied him with designs for a guitar, which Stauffer labelled ‘Legnani Model’. Stuaffer was constantly seeking to improve, and ot give to the musical world new ideas in instrument construction, and he it was who introduced the guitar with the detachable neck and fingerboard. This guitar was so constructed that the neck and fingerboard could be removed from the body of the instrument, by simply loosening a screw bolt which was inserted through the block of the handle to the inner block which holds the table to the back of the instrument. Stauffer claimed that a guitar so constructed, would take up less space, and therefore tend to greater ease in portability; but, the disadvantage occasioned by the necessity of having to adjust the neck and fingerboard to the body each time, more than counterbalanced this asserted advantage. In these guitars, too, as in the arpeggione, the fingerboard was not attached to the table, but slightly raised from it, as in the violin family.” Stauffer guitars were exceptional, as are the modern reproductions. There is no bracing on the top; it is a simple design with only a harmonic bar, but it works well, and the back is sloped somewhat like a violin. The sound is very different from the Spanish school, as is the construction. Spanish guitars have a slow response (particularly in the trebles). This means that during a split second, the sound starts softly, then grows in strengh and fades away more slowly after the string has been plucked. This is what contributes to the singing, mellow quality of the Spanish intruments. The Stauffer on the other hand is much quicker. The sound is immediate when the string is plucked; it speaks quickly. Therefore the Stauffer does not have the same singing quality, but this is not what the Austrians wanted (think romantic piano music, e.g. Beethoven.) They wanted an instrument that could play dramatic music, with a lot of expression. The basses are solid and deep to provide a foundation to your music. The Stauffer projects exceptionally well and many surviving originals as well as replicas are easily as loud as a modern classical guitar. I recently had the opportunity to play an early J.G. Staufer-Legnani, and my impression was that it was an outstanding guitar. It played easily, designed for virtuosic playing – neck shape, scale, action, all contributed to speed. It had a strong tone and a loud voice, bold and vibrant. This one was a figure-8 peg headstock, maple, of plain aesthetics, and without a raised fingerboard or adjustable neck. If you already have a Spanish instrument, perhaps it would be more interesting to have a Stauffer, since it gives you more of a contrast. Mertz played on Scherzer guitars; Scherzer was Stauffer’s apprentice who later took over Stauffer’s workshop. The music of Mertz is amazingly well-suited to Stauffer guitars. Regondi owned a guitar by Stauffer. Coste played Lacote, but he worked closely with Søffren Degen, a Danish player and composer, who used a Stauffer. Coste’s music also works well on Stauffer. Stauffer later used the neck adjustment mechanism, essentially a bolt-on neck. In the heel there is a nut that you can turn with a key. This slides the neck up or down relative to the strings, and thus you can adjust the action easily, even between pieces in concert as David Starobin has done. This design was ingenious. A few modern builders have started to re-introduce this design, but it is not widely used, due mostly to tradition. While some attribute this invention to Stauffer, a surviving Lyre-guitar of Fabricatore shows this invention earlier than Stauffer. (Photo courtesy of Bengt Wikström, Sweden). Depicted left is the Kresse Anton Staufer replica, showing characteristics of the earlier Johann Staufer. The back at the upper half was sloped like a violin, rather than straight. The fingerboard was quite innovative. 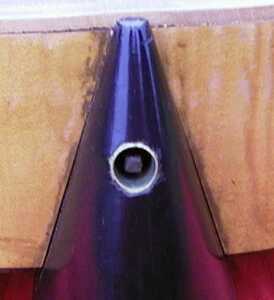 The fingerboard is not glued to the soundboard; it is elevated over the soundboard with a gap of around 1cm, like a violin. It protrudes slightly over the soundhole, to make room for the 22 frets – a much greater range. The Humphrey Millenium guitars used by Eliot Fisk, Adam Holzman, and others adapted the sloped back and elevated 22-fret fingerboard of Staufer with a few modifications. The neck was adjustable using a clock-key mechanism that allowed the player to raise and lower the height of the fingerboard to set the action. Setting the action on any other classical or romantic guitar requires surgery to sand down the nut or bridge piece, or to replace them, or use a shim. According to Ian Watchorn, “Staufer used 4 main string lengths, 640mm, 625mm, 607mm and 596mm. Virtually all Legnani style instruments by Viennese makers use either the 607 or 596mm scales.” There are actually two famous Staufers. First, is Johann-Georg Staufer, who made the famous “Legnani model” with an adjustable fingerboard, 22 frets, machine-head, etc..
Second is “Anton Staufer” – the son of Johann-Georg Staufer. Johann Anton Stauffer was probably born in 1805 and died around 1851 or later, as it appears that Anton stopped his workshop in 1848. Anton’s instruments are slightly larger in size than the earlier Johann-Georg Staufers. The sound is pleasant and warm, fresh, impulsive and with an enormous dynamic range. 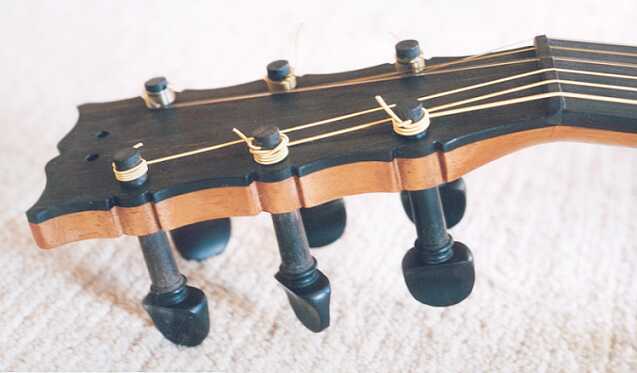 Anton’s instruments often have an adjustable neck, ~22 frets, and wooden pegs or “scroll” machine head. Bernhard Kresse has this photo of his reproduction; other photos as well as the original Anton Staufer are in the link below. More Staufer Photos … The Memoirs of Makaroff mentions Staufer, and an interesting note that Makaroff’s Staufer guitar was actually built by Schertzer. Staufer’s shop foreman was none other than CF Martin, who founded the Martin guitar company (more below). (Though it is reported that Martin was foreman of the guitar case making operation). Martin’s history is well-documented, and a good place to start is the Martin Guitar Company’s web site history section: www.martinguitar.com. There are also several books available on Martin history. “It was Vienna’s Johann Staufer, who began making guitars about 1800, who is the undisputed early master of the instrument. According to devotees, in guitar history somebody is always reinventing the wheel. If this is true, then Staufer was one of those responsible for making the prototype. At least a half-dozen twentieth century “innovations” can be traced back to Staufer’s workshop, including the scroll-shaped peghead with the tuners on one side, the detachable neck, the raised fingerboard and the first “signature” model guitars endorsed and autographed by famous artists of the day. Unfortunately, innovation never has guaranteed success, and Staufer, who stopped making guitars in order to produce violins, died in the poorhouse in 1853. Ironically, it was one of Staufer’s employees, a shop foreman named Christian Friedrich Martin Sr., who would become one of the most famous guitar makers in the world. He would do it not in Vienna but in the small town of Nazareth, Pennsylvania. C.F. Martin & Co., one of the oldest continuously owned family businesses in the United States, is still headed by a C.F. Martin (the fourth), and remains in Nazareth to this day. “I think a lot of people are beginning to see that these early guitars are more than just musical instruments; they are cultural icons.” … A case probably could be made that Staufer’s influence on C.F. Martin was comparable to that of Niccolò Amati on Antonio Stradivari, who apprenticed under him in the mid-1600s.” Editor’s Note: While Stauffer was clearly a leading builder, others were also early masters of equal talent. There is no evidence of Stauffer dying in poverty, but rather some evidence of his success. 1835 Martin at www.themomi.org – Mark Twain’s original guitar. Other notable builders of fine guitars included: Lavigne, Roudhloff, Coffe, Petit Jean, Mousset, Grobert and others… email me if you own an early French guitar which is of high caliber to be considered “great”. 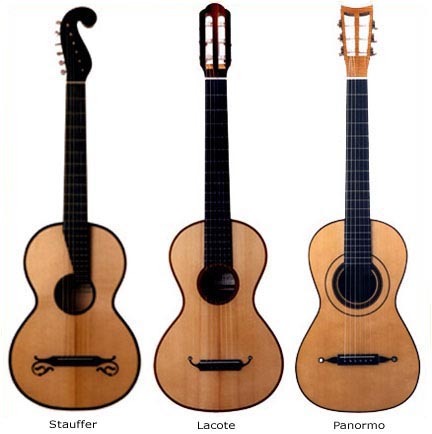 Laprévotte is also notable: these guitars had an oval-shaped sound hole, and are famously depicted by Aguado. Surviving instruments demonstrate an amazing sonority per first-hand accounts. Another innovation was the double cut-away design which is today often found in guitars for popular music. One such maker was Vissenaire; as shown in 2 examples at the William Petit site, one is labeled 1824. The guitar depicted in this photo appears to be older, based on the frets on the soundboard and peg tuners. It is often said that Lacôte came from the instrument-building center of Mirecourt and later moved to Paris. However, Alain Bieber points out that “In Paris the few ‘experts’ I met doubt very much that Lacôte was from Mirecourt. A very old mistake by a German dictionary was reproduced over 100 years. The best bet is that he was born in Paris or the Paris area, where he spent almost all his years. He might have been with Pons when Pons was still in Grenoble during his apprenticeship.” I asked French early guitar experts Sinier de Ridderabout the many labels, styles, and different addresses on the Lacote labels, and if Lacote had a “master series” and “workshop series” like Panormo? In other words, are some Lacotes mass-production, and others are more expensive, better models? Does the label or address determine which kind of Lacote? Their answer is as follows: “Lacote had several (quality levels) of guitars, during all his career (except the beginning of course). He made guitars unlabelled, for great dealers of his time, and some guitars for the British market (again!) with paper label Lacote inside and an English brand on the head. He made also the firm “Lacote & Cie” who sold guitars of different qualities (always top!) until 1845 and 1860 (more or less), and he used several templates for bridges, pruflings, neck, head, etc… but this has nothing to do with his diverse addresses (on the labels). As J.B. Vuillaume did with his “Ste Cecile”, he had a less expensive model, “Lacote & Cie” and a “master series”, but the musicians could ask for special arrangements, for example the width of the fingerboard, or one particular model of bridge, or pegs, etc…” Lacote labels exist with different styles, and different addresses. Authentication of labels is a matter best left to the few experts in the field as many fakes exist. Strangely, I have observed many “Lacote & Cie” labels where a piece is cut off and a portion of the label has been scratched out deliberately, where it would have the date and the words “BREVETTE D’INVENTION”. They are all scratched in the same way, which would tend to indicate this was done during the period, perhaps due to a patent expiration or similar. Some of the labels have dates, while others have only the Exposition date (not the date of the instrument construction), or 182_ or 18__. Hopefully, someone will finally publish a book on Lacote to sort all this out with primary sources. Lacôtes are a bit inbetween the Spanish and the Viennese guitars. They are described as having a refined, elegant, and complex sound. French guitars were very popular, and most of the guitarists based in France played French guitars; Sor concertized with Lacote, the Italians such as Ferranti and Carulli later played Lacote, as did most of the leading musicians in Paris. Sor cites Lacote as his top recommendation, along with his favored Spanish guitars. “…if I wanted an instrument, I would procure it .. from M. Lacote, a French maker, the only person who, besides his talents, has proved to me that he possesses the quality of not being inflexible to reasoning… The guitars which I have always given the preference are…, and those of M. Lacote of Paris.” – Fernando Sor, “Method for the Spanish Guitar” English Translation of 1836, published by Tecla Editions. Rene Lacôte is the most well-known French guitar builder mostly due to the endorsement of Sor, Carulli, and others. Lacote ran a large retail shop, and labeled guitars for sale by other builders as well. Period Lacote guitars are very hard to find and authenticate. However, many excellent replicas exist that fully capture the sound and appearance of the originals, due to excellent and accurate luthier plans available on the internet, based on surviving originals. According to Gary Southwell: “René Lacôte 1785 to 1855 was born in Mirecourt, France; a noted centre for instrument making, and later moved to Paris where he established himself as one of the greatest luthiers of his time. His guitars were fine examples of the French style and have a wonderfully bright sound with a quick response, largely due to the transverse style of strutting the front. Lacôte made many experiments and innovations; he worked on ideas with, and made instruments for, players such as Aguado, Carulli, Ferranti and Sor.” Unfortunately, many counterfeit Lacote guitars exist, since the Lacote labels were objects of forgery even during his lifetime. I personally once bought a fake Lacote. Antonio Torres began building guitars during the end of the Early Romantic Guitar period. 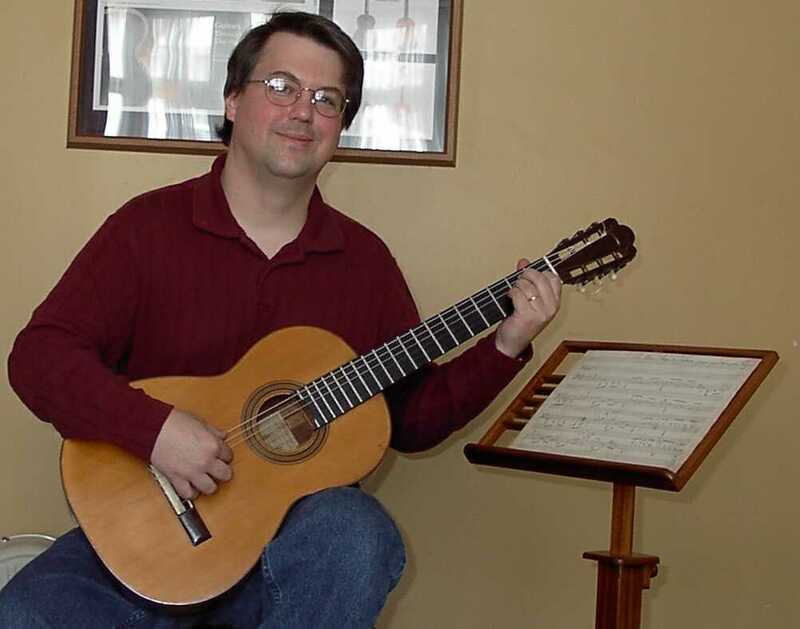 Torres is known for the style of guitar that is basically the modern classical guitar today. Torres built in two major epochs. 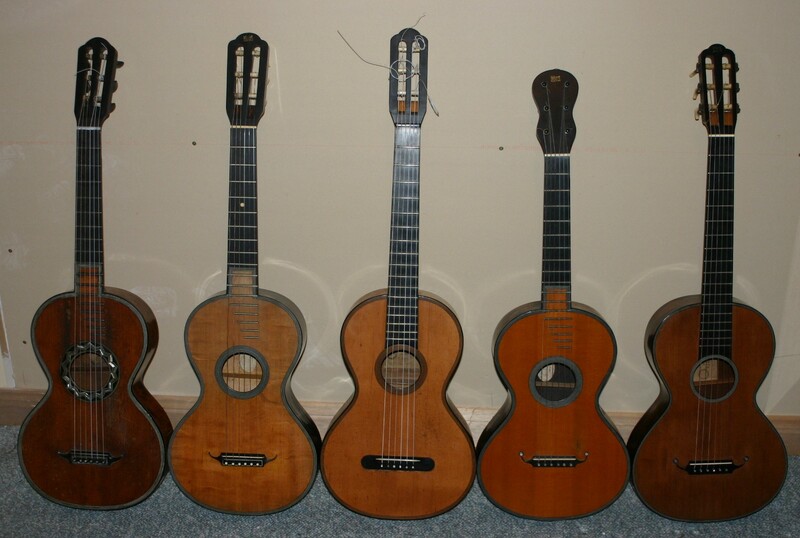 Some Torres guitars were more similar to existing Martin, Martinez, and Pages guitars of the day, with smaller scale lengths and smaller bodies. Other Torres guitars, and the performers who popularized this design, launched the late Romantic and subsequent modern era of the guitar. I once had the privilege to play an original Torres guitar, owned by Jimmy Westbrook. It played and sounded like a modern classical guitar, but not so boomy as some are. It had a nice sweet tone, and excellent capacity for tone color, a strong voice, clarity – in short all the things a good Spanish guitar should be. It sounded plenty “Spanish” – and sounded great playing Julian Arcas. The wood used was terrible, really – 3 piece mahogany back, with a nail hole covered up because it was furniture wood. Despite having modest materials, Torres was an excellent builder. Many people follow the blueprints of Torres or Lacote or Staufer, and simply cannot build as good of a guitar. However, many surviving Torres guitars are in bad condition and do not sound well anymore; fortunately, Jimmy’s was probably one of the better ones. Though important historically, objectively speaking, many of today’s modern concert guitars sound better. Although it was magical playing an original Torres, I cannot honestly say that it sounded better than my 1994 Contreras. 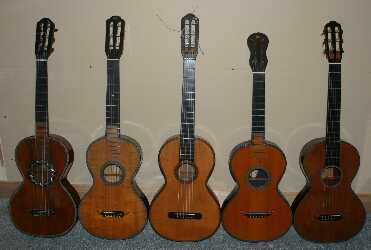 To anyone thinking of an original Torres, they are very expensive, and beware of the many fake Torres guitars ! “Guitar built by Brian Cohen 1999, taken from an original Torres, no. FE 08. The original guitar is regarded as Torres’ masterpiece, made specially for exhibition. 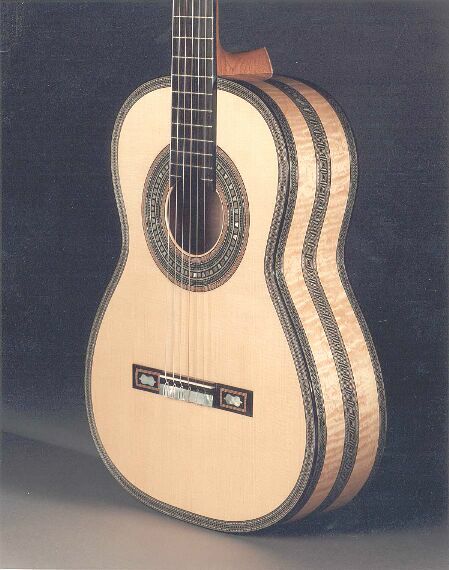 ( This copy contains over 92 feet of handmade double-herringbone purfling, and over 100,000 individual wood inlay blocks set in the complicated geometric pattern on back, ribs and table).” Editor’s note: This guitar shows the Torres “ideal” guitar, very much in the 19th century style with a large Spanish rosette, ornate purfling bands, and an ornate bridge. The simple, plain aesthetics of other Torres guitars, including the extremely ugly plain rectangular wood bridge on today’s modern classical, was more a function of limited financial resources by Torres than a decision that such plainness was desirable. The back and sides were flamed maple, also typical of early 19th century guitars. Brazilian Rosewood was used as well in many guitars because at the time, as it was furniture wood which was shipped to Europe. Torres did not invent the Spanish guitar. He built very much in the style of other Spanish builders. Other guitars from that period from Spain have a nearly identical design and shape. Torres did not use different woods than other builders. Spruce tops have been used for centuries. Maple and Rosewood were common on guitars from 1800 and older, and Torres built with maple, rosewood, and cypress as did other builders of his day. Tarrega’s guitar was maple back and sides, common in other romantic guitars. Torres typically did not use better materials than other builders. Surviving instruments show that old pieces of furniture (with nail holes patched), mis-matched pieces, 4-piece backs, knotted wood, etc., were used: Torres was in poverty and often used cheap materials. He was a talented builder with good craftsmanship despite having poor materials. Torres did not invent fan bracing. The fan bracing system was typical of Spanish classical guitars dating back to at least the 1750′s based on surviving dated instruments. It was common in the late 18th and early 19th century Spanish instruments. Panormo guitars in the 1830′s also show 7 fan braces, and 8 fan braces in the 1840′s. Torres did not invent the tie block for fastening the strings. This was used on Spanish guitars at least as far back as the Baroque guitar. Torres did not invent or introduce mechanical tuners. These were introduced around 1823. The Lacote bottom mounted, enclosed tuners, remains a brilliant design to the explosed gears of the modern classical guitars which is fundamentally unchanged since the 1820′s. The Viennese scroll-headstock design with 6-a side tuners (like a Fender Stratocaster) is also an attractive and functionally effective design. Torres did not invent the dimensions and size of the guitar. The upper / lower bout proportions had been done in various ways by Martin, Guadagnini, Panormo, and other Spanish makers. Torres took some elements from each style to craft his own style. It should be noted that original Torres guitars were smaller than today’s modern classicals with a slightly different sound; the modern guitar has evolved and gotten bigger since Torres. A true Torres copy would be an interesting period guitar for Spanish music of the second half of the 19th century. Tarrega did not have any known involvement in guitar design. It was Tarrega’s teacher, the great maestro Julian Arcas who worked with Torres to design his guitar in the 1850′s and 1860′s, when Tarrega was a child. 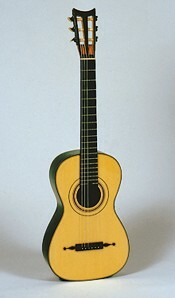 Tarrega later obtained a Torres guitar, and popularized the instrument design. Torres guitars are not louder than all other romantic guitars. Loudness varies by instrument, and a larger size does not automatically mean greater volume. Torres guitars do not have “better” sonority or resonance than romantic guitars. These are subjective matters of taste. They may sound different, but neither is “better” per se. Torres did not increase scale length. Spanish guitars in 1790 had 660-670 scale, larger than today’s 650 scale. Many early French guitars from 1800-1820 were 650 scale. Stauffer made 590-647 scale, and Lacote made 635-650. In those days it depended on the size of the customer’s hands. Torres made scales from 605-650, according to his customer’s wishes and hand size. Torres guitars were not immediately viewed as superior to other designs. Torres lived in poverty and never achieved commercial success. French and German designs similar to Lacote and Stauffer prevailed until the 1920′s, when Segovia’s influence popularized Spanish instruments. Torres did not eliminate ornate designs, nor was it believed this affects the sound. The exhibition Torres guitar replica by Brian Cohen was very ornate. The lack of ornamentation was a reflection of economic adversity by Torres and the budget constraints of his clients. Shown below are several Spanish builders of the early 19th century. I am most grateful to the vintage guitar dealer Spanish Guitar Shop for providing most of these photographs of exceptional early Spanish guitars. Many of the dates are guesses. 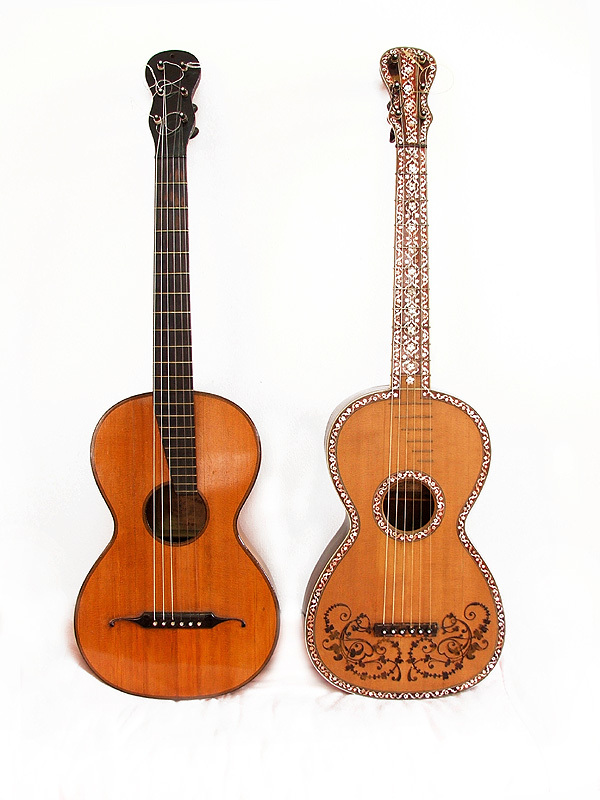 Spanish guitars from the 1790′s to the 1820′s often had double-course strings, e.g. 12-string guitars, while others were 6 string. Click photo for more photos and informationNote: Since there is surviving music for the English “Guittar” and reference to it, it is important to show this instrument of the late 18th century, which is not really a guitar at all. 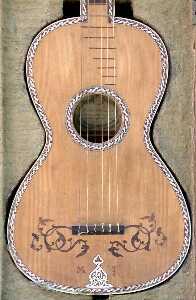 In England, the “Guittar” was popular in the 18th century, but this was actually a modified cittern, with wire strings and open C-Major tuning. Rob MacKillop proposed that the cittern was introduced from Germany. The Spanish and Romantic 6-string guitar in normal guitar tuning did not become popular in England until the early 19th century. Shown are L-R: Johanning circa 1850, Manby circa 1840, Goulding circa 1830, and J. Guiot 1844 (photos: Music Treasures, Guiot by Guitar Workshop). The guitar depicted here is the “London Model” by Kenny Hill. Some are made in the Hill workshop, whereas others were made in Paracho, Mexico. It is not an exact replica, but it plays very well with a good sound. The neck is re-inforced with a truss rod (not visible), and other changes were made to accommodate high tension classical guitar strings at normal A440 pitch. The neck and fretting is modernized, though 1cm more narrow at the nut than a modern classical guitar, and 635 scale. I personally owned one of these guitars for over 2 years, which inspired me to pursue 19th century guitars in more depth. These modern elements and lower price of the Paracho version make this guitar a good introduction to the 19th century guitar. Although I later sold mine to acquire several period antique guitars, and more expensive historically-accurate reproductions, this was a good guitar for the price. Unfortunately, the Hill Guitar company has discontinued the Paracho model in favor of the more expensive Panormo copies made in Hill’s custom shop; while the custom guitars adhere to higher standards, they are more expensive, and thus there is not a good student-level romantic guitar alternative. 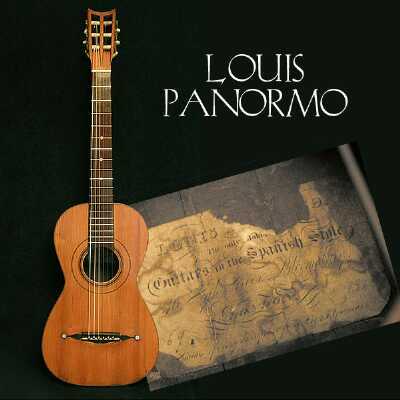 “Built in the style of Louis Panormo, an Italian born luthier working in London in the 1830s, this guitar is nicknamed “Cacahuate” or peanut in Spanish because of its distinctive shape. The volume and projection of this small guitar are quite astonishing, and the ease of playing is pure pleasure, attributable to the relatively short string length.” – Kenny Hill.